Everyone has a favorite dish at Thanksgiving. (Mine is the turkey sandwich on Friday.) 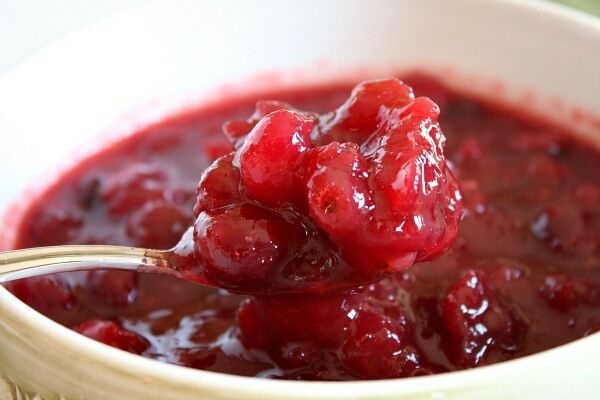 My oldest daughter’s is cranberry sauce. I never liked it myself—probably because I grew up eating jellied cranberry sauce that was store-bought and canned-shaped. But I make it for everyone else, and it quickly became her favorite. In fact, she annually indulges in an entire bowlful for breakfast the following day. (I always make at least a double batch.) But this year she’s on the other side of the country, and so, she’s on her own. This is for her. One bit of motherly—not cheffy—advice: Don’t wear white, or anything you care about, when you make this. The berries sometimes pop (aka explode) if they get going too hot. Combine all ingredients in a large saucepan and bring to a boil. At the boil, reduce the heat to a simmer and cook, stirring every couple of minutes, until the berries have popped and the mixture thickens, about 10-15 minutes. Remove from heat, cool, then refrigerate until well chilled. Serve chilled—with turkey or with just a spoon. Leftover cranberry sauce makes great sorbet. Puree it in a blender, pour in a freezable container, and freeze. Stir it every 10 minutes or so until thick and scoop-able. Voila! Instant no-churn sorbet!